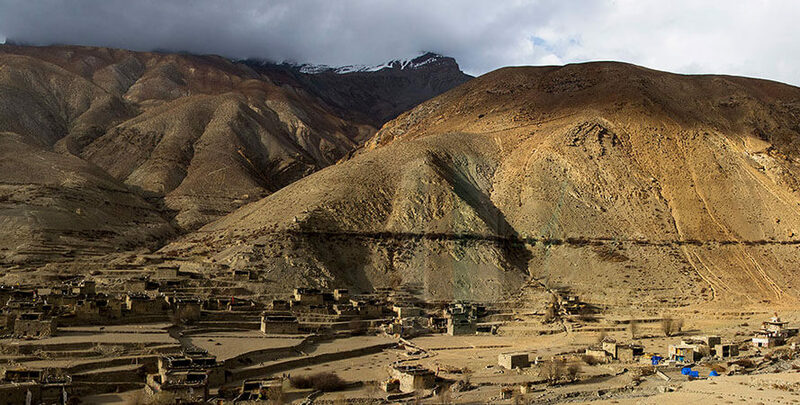 Lower Dolpo Trekking covers typical hidden destination located at the far west region of Nepal in less permit fee. 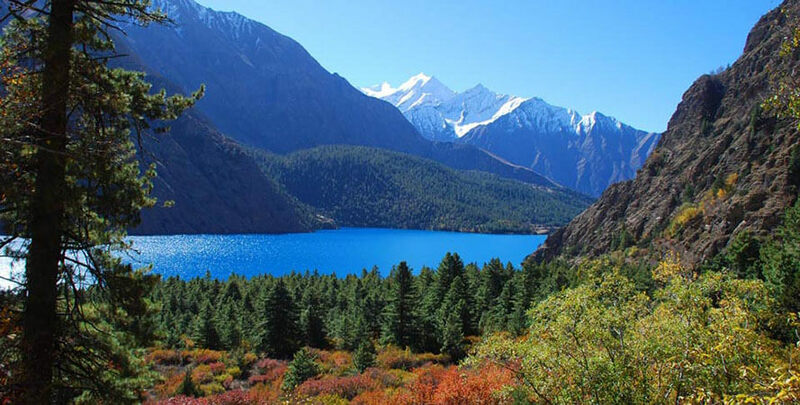 The Ringmo Village of remote dolpo region offers the beautiful Nepalese scenery including splendor Himalayan range, Phoksundo Lake and the glaciers of Kanjiroba. 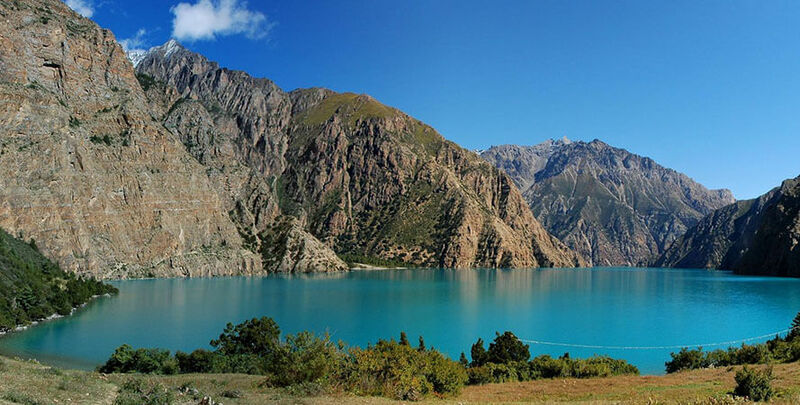 Unique cultural diversity in remoteness of the Himalayas combined with wonderful scenery of blue lakes and mountains are the main features of Lower Dolpo Region. We pass through the traditional Tibetan salt caravan track, over 2 high passes along the wilderness in one of Nepal’s most remote region. 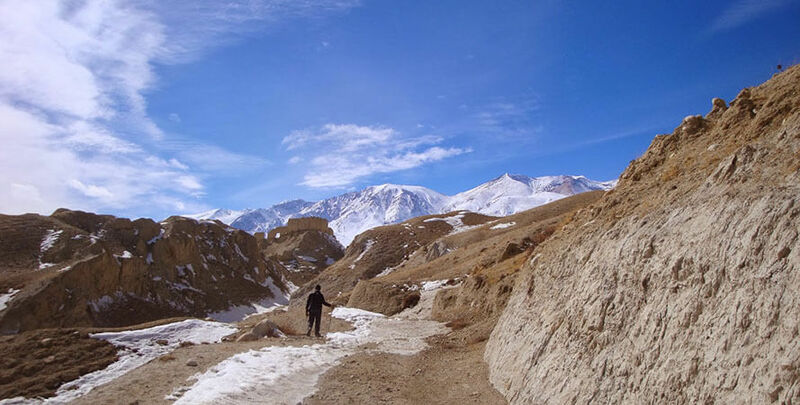 Lower Dolpo region lies further north from the Dhaulagiri Range in the sprinkle shadow of the Himalayas – reflected in the brilliant barren inclines of the. 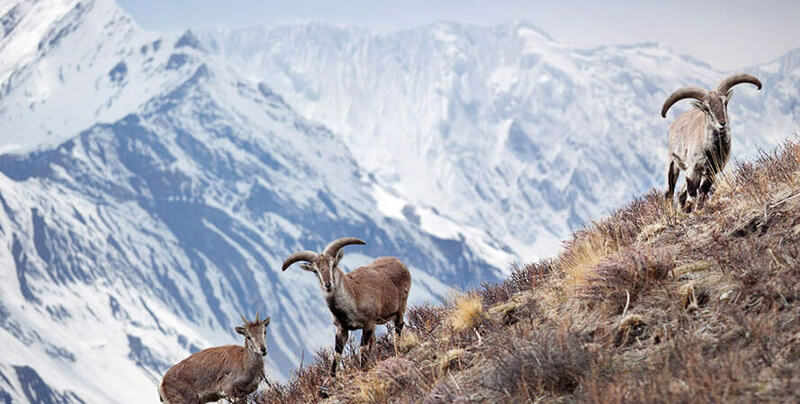 In summer, the caravans of yaks and sheep passes through this valley on a trade route through the Himalayas and exchanges the goods and ideas between the Tibetan Plateau and the valleys of Nepal. 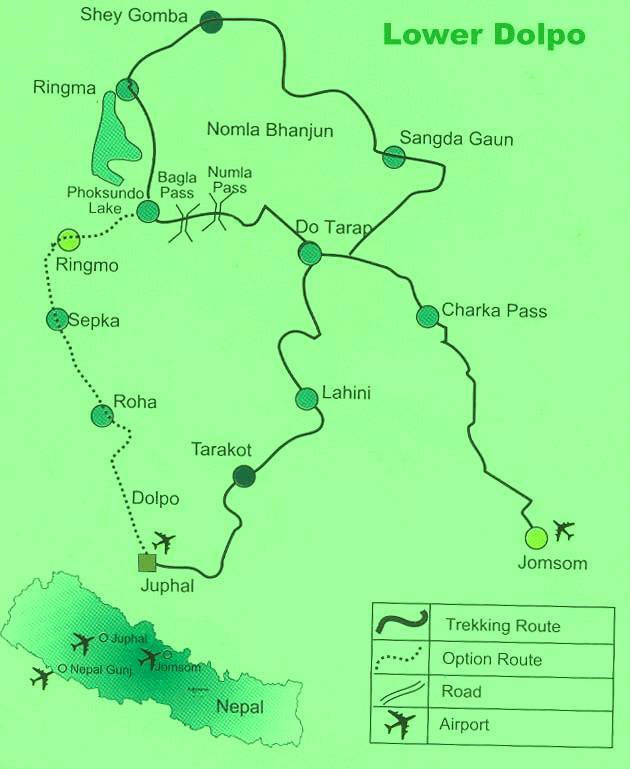 Lower Dolpo trekking starts through flight from Kathmandu to Jhupal via Nepalgunj along with special permit for lower Dolpo trekking. 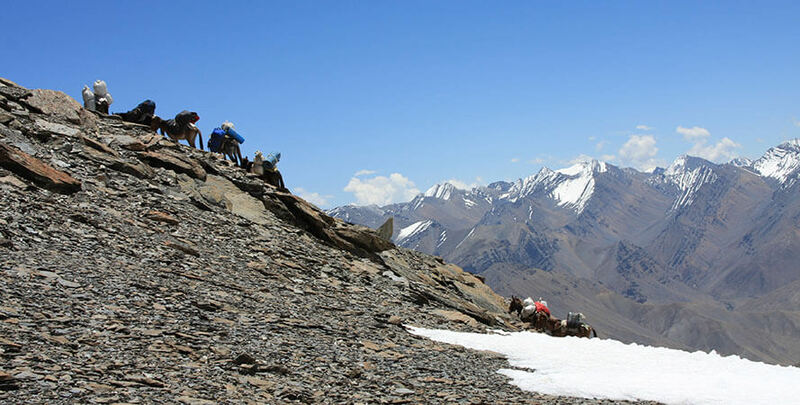 The Lower Dolpo Trek is implied for genuine adventurers wishing for an off the beaten track experience. 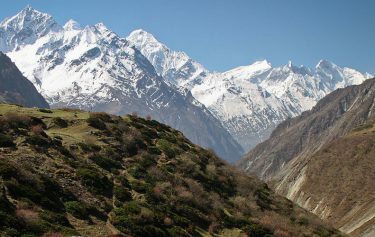 This remote region in western Nepal was opened for the outsides just in 1990. The trek passes through Shey-Phoksundo National Park with termendous mountain scenery, monasteries and yak convoys. 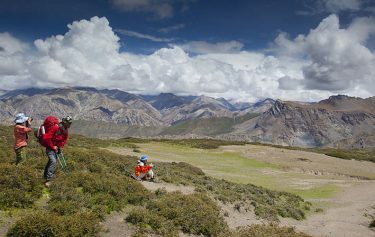 Our trek takes us through a lush region, then load through tough canyons in the barren plateau near the Tibetan border. Day 03: Kathmandu to Nepalgunj. Day 16: Cross Baga La [5090m] & trek to Numa La phedi [4800m. Flight to Nepalgunj, which lies close to the Indian border in the western Terai. You will stay the night there and make the necessary preparation for the trek ahead. Overnight accommodation will be in Hotel. We take a morning flight from Nepalgunj to Jumla. we will cross the Tila Khola and the Chaudabise Khola, The trail passes through several villages. It continues through a forest of maple and walnut and onto a meadow which, in season,the trail climbs to a small pass before descending again to Gothi Chaur where you will be staying for the night. The trail follows the Tila Khola through fields of corn, potato, buckwheat and barley until the valley narrows and then we will be entering a forest of oaks, spruce and maples. 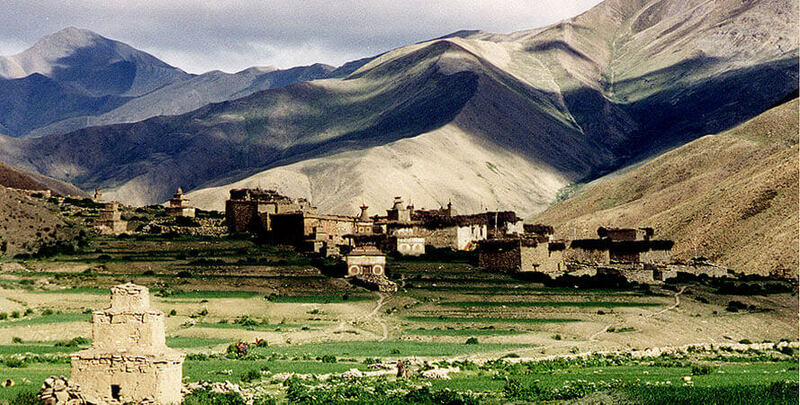 We will be passing through the village of Chotra which is dotted with typical Tibetan mani walls. After a short distance, we will come to another Tibetan-looking village, Naphukana where you will be staying for the night. There is a large gompa above this village. From Naphukana the trail becomes gradually steeper and climbs through a forest to a pass named Mauri Lagna [3820m]. From the pass, one can get views of snowy peaks to the north and east. Descending from the pass, the trail traverses a steep slope before dropping into a forest of pine and oaks. We then enter the Bheri Valley and after following the trail in and out of side valleys, we will come to the village of Chaurikot where we will be staying for the night. The trail proceeds on to the village of Balasa from where we will be able to see Kagmara peak on the horizon. The trail descends to a stream before climbing through a forest of walnut trees and onto a ridge. Passing through the apple orchards of Jyakot, we will then descend to the village of Rimi before following a rocky trail down to the Bheri Riverside where you will be staying for the night. 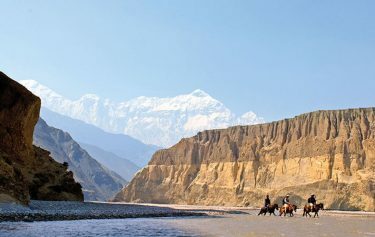 The trail runs along the west bank of the Bheri River, passing Hurikot and arrives at the entrance of the Shey Phoksumdo National Park. We will then come to the confluence of the Garpung and Jagdula Khola, which joins the Bheri River. we will reach our camp by the riverside. 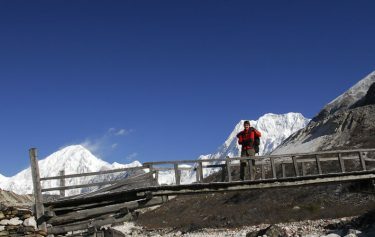 Continue Trek to follow alongside the Garpung Khola, ascending gradually towards the Kagmara La.Trek for it is mainly done so for acclimatization. It is important to note that ascending to great latitude too quickly is risky. Crossing across to the eastern side of the river, where the valley narrows and the river becomes a series of waterfalls. The trail climbs to a moraine below the Kagmara La and we will make our camp amidst the boulders. Magnificent views of the surrounding peaks will be at our door step. Start early in the morning and ascend alongside the Kagmara Glacier to the Kagmara La. This is a good place to spot the rare blue sheep. After a 900m descent, At the Pungmo Khola Valley where we will be spending the night. The trail now enters birch and juniper forests which soon give way to blue pine. As the trail contours the side valleys, one can enjoy the magnificent views of Kanjirolba peak before we reach the fortress-like village of Pungmo which is set amidst barley fields. Continuing downstream to the national park headquarters at Sumduwa before joining the trail up the Phoksumdo Khola to Phoksumdo Lake. 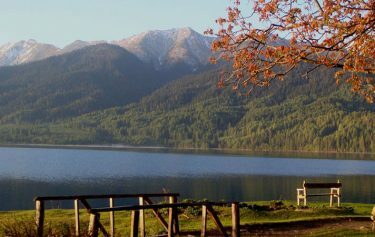 We will climb through a forest of large cedars to the winter settlement of Palam and continue ascending through the open country to a ridge from which there are good views of the lake in the horizon. There is a spectacular waterfall- the highest waterfall in Nepal close by. The trail then makes an initial descent before climbing gently to Ringmo village. After crossing a bridge below Ringmo, the trail continues northwards to the shores of Phoksumdo Lake where you will be staying for the night. We retrace our route back to Ringmo and then follow a trail eastwards, through forest of juniper and blue pine. The trail follows alongside the river up the valley to a waterfall and eventually to the base of the Baga La where we will be staying for the night. From our camp it's a 3 hour steady climb to the top of the Baga La, the second of such high passes. The descent is gradual at first but it soon drops steeply to a stream before ascending again to the foot of the Numa La where we will be staying for the night. Continue with climbing through arid country to the last of the high passes, the Numa La. It is marked by mani stones and the flutter of the prayer flags. we will be able to see as far as Dhaulagiri from the top. The trail now descends past a huge mani wall to the Tarap region and the trail cuts through the barley fields of the Tarap Valley and onto the settlement of Do. It is the largest settlement in Tarap and has several gompas. On the ridge above the village is the Ri Bhunpa Gompa and, just to the east lays the village of Shipchhok which has a Bon-po gompa which is certainly worth exploring. There are also opportunities to get great views of the valley and surrounding snow peaks from a number of nearby ridges. We will be starting off early in the morning. The trail is almost flat and follows the river until we come across a gorge. We will enter the gorge which has large rose shrubs and other wildflowers, and after crossing and re-crossing the river numerous times, the trail opens up to a flat expanse and onto Lahini where we will be staying for the night. The trail today is steep, narrow and dangerous as it clings to the cliffs and the bridges along here can often be washed out. Eventually, the valley widens and the route becomes easier as we approach the village of Khanigaon. We will then climb high above the river before descending towards the Barbung Khola and onto the fortress village of Tarakot where we will be staying for the night. We will follow alongside the Barbung Khola downstream along the south bank to the village of Lawan, before crossing to the north bank and walking for several more hours to Duna where we will be staying for the night. We will be trekking from Dunai to Juphal. From Dunai we will be following the river trail downstream to Juphal. We will also be walking uphill through meadows and past a few houses to the small hotels at Kala Gaura (2090m) where we can rest. After several more hours of walking, we will finally reach Juphal, which is the end point of our trek and where we will be staying for the night. We will take a flight from Juphal to Nepalgunj. We will then take a connecting flight from Nepalgunj to Kathmandu. Two night Deluxe Kathmandu hotel in Kathmandu on B/B. Before and After the trek. Hotel Access Nepal Pvt.ltd. All surface transportation to the starting point and from the ending point of the trek. Activities in Kathmandu like sightseeing tour.